Starting seeds makes me feel a bit less like a garden slacker. I know, I should have been doing it all along, but actually doing it counts. Seems like a long list for only three flats. The pepper cuttings are hanging in there, so not obviously dead at least. Before I start any more seeds, I'm going to have to either repair or replace the light fixtures and get new bulbs. I love my Padron pepper. I love the way it yields loads of delicious peppers for frying; I love the way it overwintered so cheerfully, despite really cold weather; I love that every once in a while it throws a really hot little pepper, just to keep the eater on their toes. Even though it did overwinter, I'm a little leery of assuming that everything is going to be hunky-dory again. We could have a harder freeze, or I could just want more peppers than one (admittedly champion) plant will produce. Friends could want in on the Padron-love. So I decided to try making more of the very same plant through the magic of cuttings. When I worked as a garden helper on a posh estate, we took cuttings of things all the time. Sometimes they worked, sometimes not, but it was pretty fun all the same. I tried to get tips that would be both woody enough for self-support and green enough to be sprouty, although it was guesswork on my part. 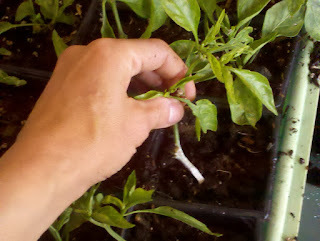 I remembered to cut a diagonal end on the stem, causing more of the rooting layer to be exposed. Unless that only goes for trees. At any rate, these had a diagonal tip. 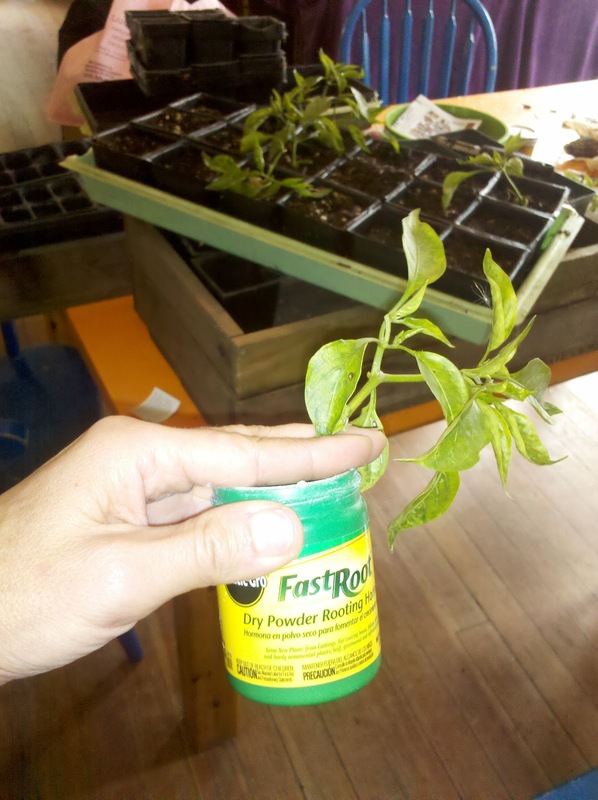 A simple jar of powdered rooting hormone is supposed to promote root growth. After dipping the cut end, I tapped off any extra powder. No sense wasting it, and there were as many dire warnings on the stuff as you'd imagine. No eye contact, skin contact, breathing it in, ingesting. . . I didn't want to see if I'd sprout roots, so I just didn't touch it or snuffle it up my nose. I tried to keep as much of the powder on the stem as I put the cutting into its pot of soil. A pencil made holes that were just about the right size. Quite a few of the cuttings came from sideways branches, so they were leaning all akimbo. I figured if the cuttings take, it won't matter how they were leaning. They're all resting under a plastic dome, for humidity. Because the cuttings don't have any roots (yet) to take up moisture, but have lots of leaves to expire moisture, they are a little sad looking today. I did trim many leaves off, and also cut off any buds. There were a surprising amount of them for cold December weather. Such a great plant! 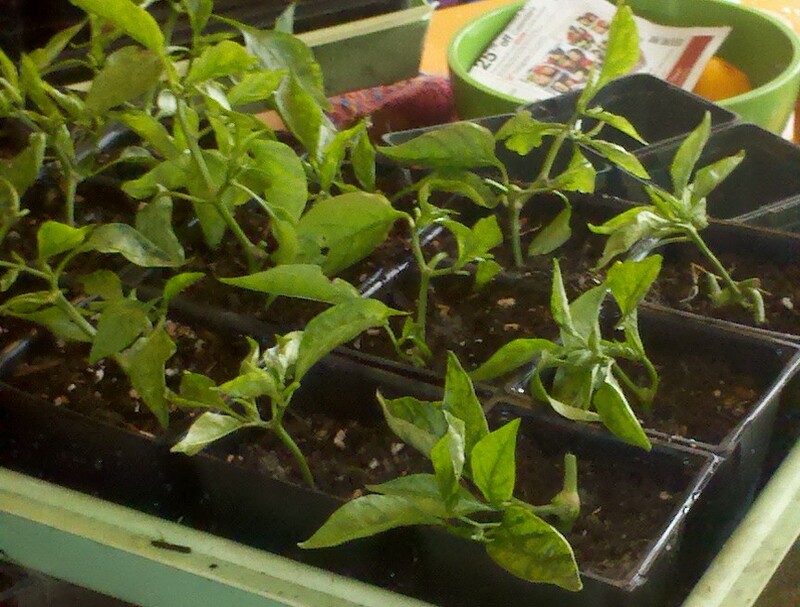 At any rate, if this works, I'll have a dozen new pepper plants, certainly enough to share. New house construction is really at a low these days. After acting as my own contractor, I'm thinking I can almost understand why. After my subs ate 1/3 of the building materials*, and we had to use inferior substitutions**, and we had to push back the closing by seven times, well, it's a wonder anything got built at all. So the trip to the home furnishing place means the whole village will soon erupt in seasonal colors. Next year, we're thinking castles. * And then threw up repeatedly, all night long. Yay. Not one grabbing and eating, but two. ** Lard, the cheap kind, instead of butter. I like butter too much to do this over and over. Besides, the dogs don't deserve it and I bought good candy for the kids. They have to just not eat the houses themselves. I've been singing since I came in from the garden. Finally a bit of rain after so much cold, but dry weather. The garden needs it, and I need it since the breakdowns in the irrigation system mean watering isn't a hands-off experience. At least until I get the problems fixed. I used to live somewhere where it rained almost every night most of the year, and was generally clear during the day. It was nice in that respect. From my current perspective, I didn't appreciate it enough. My sandy soil, even with amendments, drains quickly and the plants prefer consistent watering. So I am always happy to see our rainy season come along when things like carrots are much easier. Even so, there are pockets of my garden that are not as fortunate as others. This bed is in the middle of the yard, beside the apricot tree but not under anything. Nice and moist. Then, there's the Acacia Tree of Doom. If you were an onion plant or a volunteer Red Russian kale, this would be your skyward view. Personally, I wish this tree would go to the great beyond the way the one in our yard did years ago. I'm not in charge, however, so we content ourselves with cutting back what we can. Really dry under there. The rain has to be excessive or at a slant to get past the tree's umbrella.In addition, I bet some of the roots are underneath it, sucking water up even if it does get to the surface. So I water this bed by hand or carefully plant dry-tolerant crops there. What kind of microclimates does your yard have? Rarely do really hard freezes hit our area. 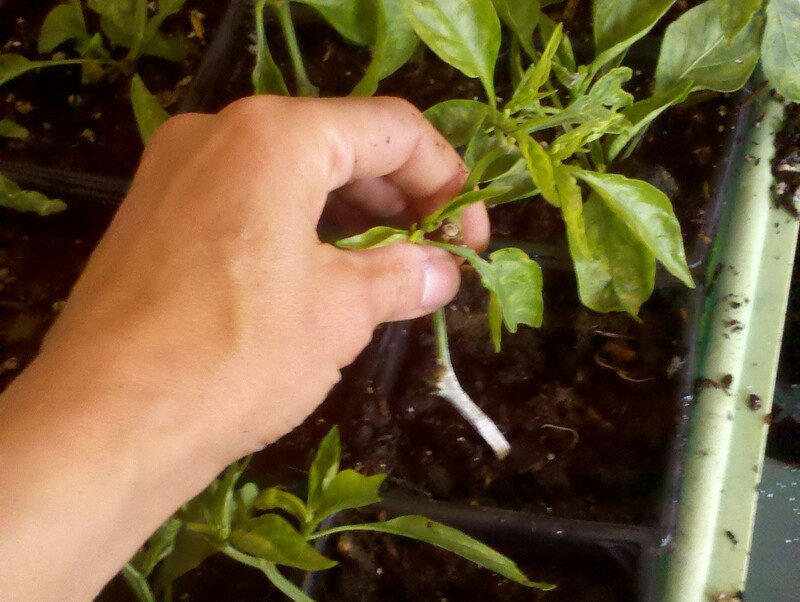 If they do, the citrus growers scramble with smudge pots and gardeners cover up delicate plants. A few years ago, it was easy to see which plants came from tropical places -- black, slimy heaps marked what had been Datura and other softies. Not until the dogs and I rounded the shady side of the dog park at 7:00 this morning did I realize that we were in for cold weather. 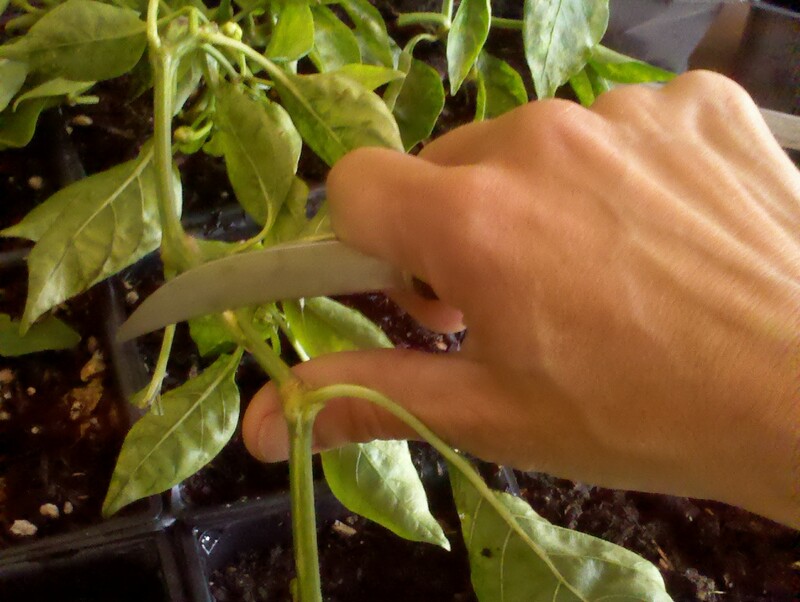 Of course, I hadn't taken cuttings from the Padron pepper as I'd planned to. Fortunately, upon inspection it looked okay. The strawberries should know that blooming in December is a bad idea. Maybe this will convince them? Hardy parseley, kale, and the other cole crops just looked pretty but not overly put-upon. Garden stalwarts. Everything else looked pretty okay, and today marked the first time I used warm bath water to water the seedling beds. It's so much easier on my hands than pumping cold rainwater from the barrels. Because of the hole in the pipe, I'm going to be doing some hand watering until I get my act together to fix the irrigation! I still like the copper chicken sculpture. Maybe I should try to make more garden art. Oddly enough, Tor, Ellie, and I aren't as good at archery as we hoped. The box with a turkey drawn on it remained mostly unscathed, but the irrigation pipe is a goner. Cilantro can be picky for me -- won't germinate, bolts immediately, etc. But let a plant go to seed, and it's Salsa Pathway! Maybe I'll use the last of the tomatoes and make a batch, after harvesting with nail scissors.